Arterio-venous fistulas may develop spontaneously, following trauma or infection, or be iatrogenic in nature. We present a rare case of a jejunal arterio- venous fistula in a 35-year-old man with a history of pancreatic head resection that had been performed two years previously because of chronic pancreatitis. The patient was admitted with acute upper abdominal pain, vomiting and an abdominal machinery-type bruit. The diagnosis of a jejunal arterio-venous fistula was established by MR imaging. Transfemoral angiography was performed to assess the possibility of catheter embolization. The angiographic study revealed a small aneurysm of the third jejunal artery, abnormal early filling of dilated jejunal veins and marked filling of the slightly dilated portal vein (13–14 mm). We considered the presence of segmental portal hypertension. The patient was treated with coil embolization in the same angiographic session. This case report demonstrates the importance of auscultation of the abdomen in the initial clinical examination. MR imaging and color Doppler ultrasound are excellent noninvasive tools in establishing the diagnosis. 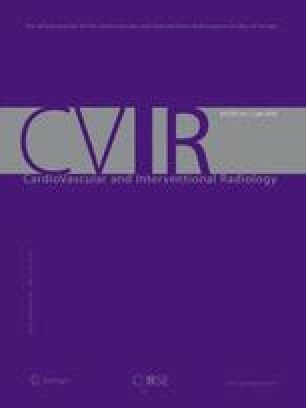 The role of interventional radiological techniques in the treatment of early portal hypertension secondary to jejunal arterio-venous fistula is discussed at a time when this condition is still asymptomatic. A review of the current literature is included.